VIENNA, Jul 27 (IPS/IFEJ) – The second smallest nation on Earth hopes to turn itself into an example of sustainable development that others can emulate. But the South Pacific island nation of Tuvalu and its 10,500 people may only have 50 years or less to set that example before it is swept away by rising sea levels due to climate change. “Construction of the first ever biogas digestor on a coral island is complete,” said Gilliane Le Gallic, president of Alofa Tuvalu, a Paris-based group that is working with the local Tuvaluan government. Located on a small islet near Tuvalu’s capital of Funafuti, the biogas digester uses manure from about 60 pigs to produce gas for cooking stoves. More importantly, more than 40 Tuvaluans have been trained at the newly opened Tuvalu National Training Centre on renewable energy. “We are trying to create simple, workable models of sustainable development that can be reproduced by others elsewhere,” Le Gallic, a documentary filmmaker, told IPS from Paris. After working on the film “Trouble in Paradise”, which documented Tuvalu’s plight as the first nation destined to be wiped out by climate change, Le Gallic felt she had to get involved in finding solutions. In 2004, she and some partners developed “Small Is Beautiful”, a decade-long plan to assist Tuvaluans in surviving as a nation, and if possible, to allow them to remain on their ancestral land. 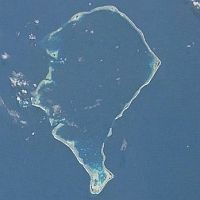 A former British colony, Tuvalu is comprised of nine coral islands topped by dense tropical vegetation covering about 26 sq kilometres in area. It is one of the world’s lowest lying nations, with less than four metres above sea level at its highest point. Last spring, the “king tides” were the highest in memory, swamping many of the islands and hastening erosion and the salt water intrusion that is making soil infertile. Sea levels have been rising here at twice the average global rate predicted by the United Nations Intergovernmental Panel on Climate Change. And this rise may be accelerating as global temperatures climb. In just the past dozen years, Tuvalu has reported sea level rises of 10 centimetres, according to the South Pacific Sea Level and Climate Monitoring Project. With most Tuvaluans living just one or two metres above sea level, experts say much of the island chain may be underwater in 50 years, and possibly sooner if a major storm strikes. More than 4,000 people have already left the islands to live in New Zealand. Stephen, although your post has been available since July I have only just seen this. We are always looking for interesting stories, about the places where biogas digester plants have been built or are planned, and this is a very poignant tale. I will tell my blog subscribers about this and hopefully some will come and visit your site. Thank you for caring about Tuvalu. I saw the HBO documentary about the sinking island, and it is heartbreaking. This is documented, verifiable proof that global warming is changing the planet. I hope all school children learn about this, because they are the ones who will develop true passion for saving the environment. Or maybe not the bad old “global warming” boogie man, but a natural progress ion of how our planet operates? A continual warming-cooling trend that culminates in yet another ice age when these places will have 1000 times the land area due to all the water being frozen at the poles? Then I suppose it will be all about over population of these islands and other like them with people fleeing the coming ice age.